Is the HQ building Haunted? In the early 1970's, as I was a kid on post, we were told the story of Mrs. Mueller. Ok, so all kids are told ghost stories, I for my part have trouble not believing at least parts of the story, adding on to it I talked to several Germans and Americans in the past, and there are versions that seem to match. Mrs. Mueller, a young German woman living in Babenhausen was engaged to a German artillery soldier stationed at the Babenhausen Kaserne. WW I had just begun and Mrs. Mueller's fiancée had just received orders to go to fight in France. Not wanting to fight the war and possibly die doing it, the fiancée and 3 buddies went AWOL and were hid by Mrs Mueller in the attic of headquarters building . They stayed undetected for a couple of days, but as Mrs. Mueller was caught bringing the 4 deserters food and water, the 4 were arrested, and sentenced to death by firing squad. BABENHAUSEN, Germany (S&S) A ghostly, unauthorized visitor has been disturbing the peace and quiet of the early-morning hours at a headquarters building here. The men who guard the 41st Field Arty Group Hq have heard mysterious sounds of footsteps, movement of furniture, creaking floors and flushing toilets from the tightly locked fourth and fifth floors. According to Sgt. Robert A. Weaver, "There's definitely something up there. "During the middle of August I was on duty and around 4 a.m. I heard a loud bang, like something was dropped," said Weaver. "Then I heard footsteps walking across the floor. They have wooden floors up there, and I could hear the wood creaking, "I checked it out, but there was nobody up there," Weaver said. On other occasions, while he was pulling guard duty in the headquarters building, Weaver has heard what sounded like "furniture being moved around." Whenever anyone approaches the fourth and fifth floors to investigate, the noises cease. The furniture always remains stationary when the rooms are examined. Maj. Roy A. Highsmith, 41st Group adjutant; has also had some strange experiences in the building. "One night I was , working late, and I kept feeling this sensation that someone was staring at me outside in the hall," said Highsmith. "The door opened several times, but it probably the wind. I lifted my head several times because I thought I saw someone walk by the door. No one was there when I went out to look. I could have sworn I heard someone walking down the hall," Highsmith said. Like the majority of those who have pulled guard duty in the building, Highsmith has heard the sound of footsteps originating from the top floors. Sgt. Michael Wilson believes that some" unnatural thing haunts the fourth and fifth floors of the building. 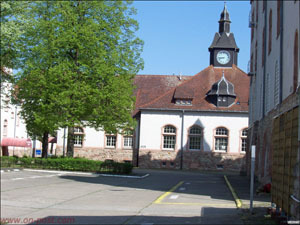 During the daytime, these floors are used as Babenhausen's education offices. Wilson said he was on duty one night when he heard what sounded like "somebody running around on the top floor. ""Between 1:30 and 2 a.m. I heard the steps coming from above, so I went upstairs to check it out. "It was very distinct. There wasn't anybody up there, so I came down again. Two or three minutes later it happened all over. As soon as I got up to the fourth floor it stopped. So I went down again. "I heard the noises for a third time, but I didn't bother with It. From 2 until 5:30 a.m. I heard the toilets flushing, desks being pushed around and running sounds. It was really strange”, Wilson said. Of course, there are skeptics among the GI’s who discount the weird sounds and inexplicable noises. Capt Benny Dever attributes the poltergeist rumors lo pure imagination. "On two of three occasions I've heard doors opening and closing up there — and footsteps, too. But I think I made myself believe in this ghost business because I've heard so many stories about it.'' These people don't know what the wind sounds like," said S.Sgt. John R., Seals. ''This building isn't haunted." Another soldier claims that the noises are merely caused by the "settling of the foundation," M.Sgt. Richard J. Soska said, "Until I heard It myself, I didn't believe in it," But between 3 and 3:30 a.m. on Monday, Soska said he heard someone walking the length of the third floor, directly above his guard duty position. "It was loud and clear, like someone was walking with boots or-heavy shoes," he .said. Upon investigation, nothing unusual was observed, and the hallway door remained locked and bolted. Muffled voices also were heard on the same night by an officer, who did not want to be identified. Naturally, the possibility of a hoax does exist. But on two occasions, a group of skeptical off-duty Stars and Stripes staffers spent the night in the building. Before starting the ghost watch, we thoroughly examined the fourth and fifth floors, fastening every window and locking every door. Each hallway is locked and bolted, and an armed guard stays on the second floor. The only access to the top floors, aside from the main hallway, is a fire escape on-the fourth floor. If a prankster did pull off a hoax, it's difficult to see how. The first night proved worthless for the ghost watchers, but the second occasion was far more productive. From 1 to 1:15 a.m., distinct footsteps were heard coming from the floor above. Various scraping and bumping sounds were also heard, but these could have been noises front water pipes .and the high winds that night;" At 2:15, five more steps were heard. Until 2:43 a.m. rather vague noises echoed through the halls from upstairs. One very distinct scrape was heard from the east end of the building. We investigated the noise immediately but found nothing. After 3 a.m. the only sounds came from the streets outside. Apparently, 2,a.m. is prime ghost time. Nearly all the people interviewed mentioned that it was between 2 and 2:30 a.m. when the footsteps were heard. Only one person — Capt. Norman R. Cherry — actually has seen anything unusual so far, but he isn't exactly sure what he saw. "I came up here one night to pick up some papers. It was about 9: 15 p.m. On the way out of the office I turned the lights out, walked down the hallway, locked the (hallway) door and glanced over my shoulder," said Cherry. “I saw a shadow walking down the hall towards me." Cherry says the "shadow" may have come from the headlight of a passing car or plane, but his office is located on the third floor. The history of the town of Babenhausen also lends a supernatural aura to the tales dealing with the casern. During the 17th century, 50 women were executed as suspected witches. The women were imprisoned in the town's Hexenturrn (witch tower) and burned alive in. the market place. One of the victims of the witchcraft hysteria was Frau Muller, accused of killing three men through sorcery. In 1843, a woman supposedly related to Frau Muller was stoned to death during another witchhunt. Twenty-four hours after her death, her boyfriend died without any explanation, a history of the town claims. 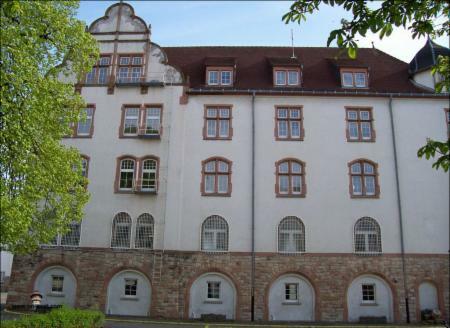 A young soldier who jumped from the fifth floor of the headquarters building in June 1920 was planning to marry a woman who worked on the casern. Her last name was Muller. Following the suicide she was never heard of again, the town’s history relates. 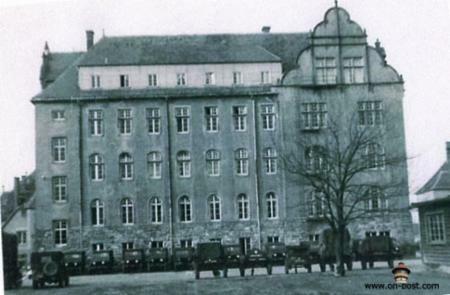 The headquarters building was constructed by the Germans during 1900 and 1901. Since that time the casern has been occupied by the French, the Hessian Police, the Freiwillige Arbeitsdienst (volunteer work service) and the Wehrkreis Rdt und Fahrschule (District Army Riding and Driving School). After World War II, the United States took over the casern as a discharge camp for German POW’s. According to legend, a young German soldier committed suicide by jumping from the fifth floor. During the investigation, the bodies of five missing men were discovered in the attic. Their deaths remain a mystery. Poltergeist is a German word that means a spirit (geist) that creates a noise (polter), Many people classify these spirits along with leprechauns, elves and werewolves. Tell someone that you believe in ghosts, and they'll usually label you a weirdo! But not in Babenhausen. I arrived in Germany in January 1972, and was assigned to the 2/83 FA’s Service Battery as a supply sergeant. My primary MOS was supply, but my secondary was Personnel. The battalion personnel sergeant soon discovered my secondary MOS and pulled me up to battalion to be his assistant. About a year later, I was transferred to 41st Group, to be the Group Personnel Sergeant (PSNCO). I told you I had served a previous tour at Babenhausen, which was back in 1961-1964. 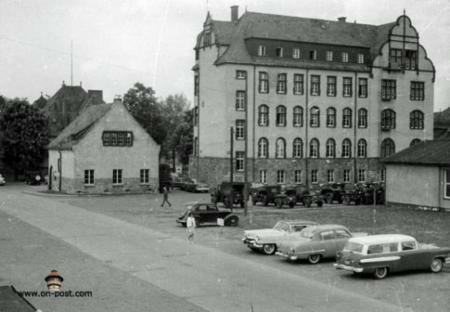 During that tour, I heard many stories about the Frau Mueller ghost and the German soldiers that died in the old Headquarters building, but I never really gave them much thought. I heard those same stories when I returned there in 1972, and still did not think much about them. I have always been the type that gets very little sleep, and back then, I would just get up and go into work. This was usually about 3AM. The only people in the HQ building at night would be the people working in the education center and the staff duty personnel. Once the education center classes were over, which was around ten each night, the two people left in the building were the staff duty personnel, and they were always behind locked doors. The 41st Group had nuclear weapons assigned, which meant only officers and NCOs with a secret Crypto clearance could pull staff duty, and because only a few of us had that high a clearance, the total number of people available to pull that duty was never more than 6 or 7 of each. This meant we pulled staff duty every few days. This also meant that it gave everyone ample opportunity to hear the sounds coming from the fifth floor. While some were willing to talk about their experiences, others refused, and one Captain in particular, after having his own personal experience with the ghost, refused to go into the building alone at night. What happened scared him so bad, that he had to be transferred to V-Corp. HQ. Whenever I would go into the office at night, I would always hear the sound of people walking on the floor above me and the sounds of things being moved around. I could also hear the faint sound of people talking. I could never understand what was being said, but it did sound like talking. I would also hear someone walking down the hall outside my office and, from time to time, I would catch movement out of the corner of my eye. Each time I checked, there was nobody there. One night, while I was working on a promotion board I had set up for the next day, I thought I spotted someone standing in the doorway. When I looked up, no one was there. What was there was the sound of someone walking down the hallway. I jumped up and ran to the door, but nothing was there. I looked outside but no one came out and there was no one in any of the offices. I shrugged it off and went back to work. Things like this happened all the time. I might add that the bottom of American combat boots were made of rubber and, while they made a loud sound when you walked on wooden floors, they were not as loud as the sound of a German hobnailed combat boot. These were the type of boots used by the German Army and were the type of boots worn back in the early 1900s, when the ghost stories began. In early 1974, we had a new PIO clerk assigned. A few months later, he came to me and asked if I knew anything about the female ghost. I told him what I knew about the Frau Mueller story and he said he had been doing his own investigation and discovered the story was well known and that the local Babenhausen newspaper even did a story several years ago on the ghost. He mentioned that he had a friend who worked for Stars and Stripes and that he wanted to do a story. He came to me a few days later and asked if they could do a ghost hunt in the building. He said it would only be him, his friend, and a professor from West Texas College. He asked if I could be there as well, and even asked if I could get person who had never had experiences with the ghost to attend. I received approval from the Group CO. The stage was set. We set everything up for the following Friday night. Everyone met in the CSM’s office around 7PM. Back then, we had none of the ghost hunting equipment they do today, so the only thing we had was a still camera and a tape recorder. Our plan was simple, we would go to the fourth floor once the education center closed, and check each room. We locked every window in each office, and closed and locked every door leading into the hallway. We also closed and locked all windows facing the street. If you look at the picture, you can see there are no fire escapes on any floor. The only way in or out of the building was by that one staircase. As we left the floor, we closed and locked the swinging glass doors. The door to the attic was already locked, and the key was kept across the street in another building. We went back to the CSM’s office to wait. To make sure we made little sound, we all took off our shoes and only spoke in whispers. That would have been a perfect night for a ghost hunt, as it was stormy, windy, and rainy all night. As luck would have it, nothing happened. A couple of weeks later, the PIO clerk came to me again and asked if we could try one more time. I got permission and we set it up for that Friday night. That night we met again and went through the same routine. The weather was great. It was warm with no wind or rain. After checking everything, we went back to the CSM’s office to wait. While there, the S&S reporter asked several questions and began writing his story. The college professor told us he had always been interested in the paranormal and that Hans Holzer was one of his favorite authors. As I also liked Mr. Holzer, the two of us struck up a conversation about the paranormal. As the night went on, nothing happened. About 2AM, I decided to make some coffee and the S&S reporter and I walked down the hall to where our coffee pot was located. After starting the coffee, he and I were standing there talking about the ghost stories, when we began to hear the distinct sound of several people walking on the floor above us. We walked into the hallway to tell the others what we had heard, but they heard the same noise and were coming out of the office. We stood there for several minutes listening to the sounds coming from the fourth floor. The funny thing was that everyone wanted to be on a real ghost hunt, but nobody really wanted to go upstairs to see what the noise was, so the reporter and I decided to go up and see for ourselves. The others stayed in the office where the coffee pot was. I guess they really wanted a cup of coffee. We got to the fourth floor and found the glass doors still locked. Looking down the hallway, we could tell all the offices were still locked. I unlocked the doors and we went in. We went into the room directly over the room we had been in below, and I dialed the phone number in that office. As I was dialing, the reporter said he could feel the room get colder. I could too, but did not say anything. I actually thought we might be a little scared. Anyway, the professor answered the phone and I asked if he could hear anything. He said they could all clearly hear someone walking down the hallway and in the room where we were standing. I told him to listen while I put the receiver down and we went through each office. All doors were locked, and as we went inside each room, we found the windows still locked as well. We relocked the doors and checked the windows facing the street. They too were locked. We went back to the office and the reporter picked up the receiver. He told the professor what we found, and asked if they could still hear anything. They could. He stopped and told me they could clearly hear several people walking down the hallway and into the office where we were. I walked into the hallway but saw nothing. However, I could plainly hear footsteps coming down the hall. I was about to turn and say something to the reporter when I saw a shadow go by me on the left. The reporter saw it too, dropped the receiver, and ran into the hallway. There was nothing there, but it had gotten very cold. We went back into the room and, as I leaned on a desk that was against the wall, something rocked the room and tossed me against the opposite wall. It felt like something heavy had been thrown against the wall in the next office. I can tell you that it scared the hell out of me. I mustered up as much courage as I could and walked into the hallway. The office door next to us was locked, but the light inside was on and I could clearly make out the shadows of someone moving inside. I called for the reporter, but he was so scared he would not move. I had to have someone else come upstairs because I was too scared to open that door by myself. The person who had never heard the stories and did not believe in ghost came up. We opened the door and were immediately hit with a blast of very cold air. I think he became a believer right then. The room was freezing to the point you could see your breath, but it almost immediately went back to warm. We could see nothing out of place and nothing that would have made that noise. I turned off the light and locked the door. We went back downstairs to talk about what we saw and heard. The rest of the night, we could hear movement upstairs and one or two even said they could hear crying. I never heard that. The next morning, Saturday, we decided to call it a day. A few days later, we were hit with a 7th Army alert, which meant we had to load up and move out to our holding areas. The alert came about 1AM, and we were in our positions, which were just outside the Kaserne, by 5AM. Later, the Group XO sent a young Captain back in to get some papers he left in his office. As the Captain turned to lock the swinging glass doors, he saw a dark shadow coming down the hallway toward him. He had only been there a short time and did not know about the ghost, and the S&S article had not yet been published, but when he saw the shadow, he forgot the door and ran out of the building. When he got back to the area, he was white as a ghost and shaking all over. He told everyone what he had seen and refused to enter the building again. When he ran out of the building, he dropped the XO’s papers. My boss and I went back in to retrieve everything and when we got there, we could tell the Captain had left in a hurry because everything was on the floor and the keys were still in the lock. A few days later, the story was published. It was even on the front page. My PIO guy took a picture of the building that was to be used for the article. The CO’s vehicle was parked in front. For the article, they decided to use the picture in negative form, which made it look spooky. Once the story came out, people began coming forward with their own stories. A German paranormal TV show came out and did a segment for German TV, and several German newspapers did stories. I had several more experiences with the ghost, but as it never bothered me, I saw no reason to bother it. An interesting footnote on the subject happened about two months before I was due to come back home. My replacement came in early and once I broke him in, I asked to go over to the 2/5th FA because they did not have a PSNCO. One day my replacement came over and I could tell something was not right. I asked what the problem was and he asked if I knew anything about the ghost. I told him the story and he said he had been hearing the same noises. It apparently got to him so bad that he almost had a breakdown and had to be reassigned back to the states. I was asked to extend my tour a year, but already had an assignment and my family was ready to go home, so I left. I did manage to keep in touch with some of the guys there and they reported several more ghostly experiences. I always wanted to go back and do a real ghost hunt there just to see if what I experienced was real. The story that appeared in S&S was a much-watered down version of what really happened. There was only one entrance and exit for the building, and that was by the staircase. Going up the stairs, you come to the landing for each floor. As you reach each floor, on the right is a swinging double glass door that leads down a long hallway. As you walk down the hallway, all offices were on the right. On the left were windows facing the street below. At the end on each hallway was one large office. The windows for these offices are what you see as you look at the picture. I might add that all floors were made of old hard wood. These wooden floors made a very loud sound as you walked on them with combat boots. On the bottom (ground) floor, of the building was the 41st Group S4 offices. On the second floor were the S2 and S3 offices. This is also where the Group Staff Duty Officer and NCO were stationed. I will get to the third floor in a minute. The fourth floor was the education center, and the fifth floor was the attic. This is where most of the sounds came from. Going from right to left, as you look at the picture, you see two large windows to the far right. On the third floor, the first large window was the Group CO’s office. The next was the XO’s office. The next two smaller windows were the CSM’s office. The next two belonged to the S1 Officer and me. The next belonged to the Adjutant, Legal, and PIO. The next window was where our coffee pot and storage were located. The offset windows to the far left were where the staircase was located. My office was on the 4th floor, as were the offices of the Group Commander, XO, CSM, S1, Adjutant, and PIO. I would always hear footsteps and things being moved, but never gave them a thought. At night, all floors were locked and the only people in the building were the officer and NCO pulling staff duty, and they were always behind locked doors, because the Group had nukes assigned. At times, I would even catch something out of the corner of my eye either walking past my office door or standing in the doorway. At first I would get up to see who was there, but nobody ever was. 41st Group had offices on the all but the 5th and 6th floors. The 5th was the education center and the 6th was the attic. Until our hunt, most of the ghost stories were centered around the 6th floor. That is where the 6 Germany soldiers died back in the early 1900s, and where Frau Mueller jumped to her death from.